Elytra ( /ˈɛl ɪ trə/ ᴇʟ-i-trə) are rare leathery wings that are used to fly through the air. Elytra can only be found in end cities, in an item frame in the treasure room of the end ship. A shulker guards the elytra wings and the ship’s two loot chests. Elytra are equipped in the chestplate slot. They can either be placed directly in the slot, or be equipped using a dispenser or by pressing use item while in the hotbar. They are gray in color by default, but when worn, they will adopt the design of any cape the player is wearing. The elytra wings will always have the same texture on the player's back, even if broken or enchanted. To begin flying, the player must press the jump key while falling. When activated, the elytra wings will spread apart similarly to a bird’s wings. The player can turn by facing in a different direction. Flight speed will slowly decrease the farther the player travels. If they attempt to fly upwards, speed, and therefore height, will decrease faster. If the player falls really fast before activating the elytra, flight speed will increase. Flight speed is affected by Slow Falling. The mechanics allow a player to use the speed gained from gliding downward to almost reach their previous altitude if they switch to moving upward. Sudden changes in direction greatly reduce the player's velocity. In Creative mode, the player can also fly up by holding the jump key‌[Legacy Console and Bedrock editions only]. The player will not take fall damage while gliding unless they hit the ground or a wall at too great a velocity, which can be caused by nose-diving or stalling. The fall damage will then be calculated off of the height fallen during the nose-dive or stall. A flying player has a shorter hitbox than usual: a 0.6 block cube centered on the player's feet. Durability decreases by one point each second when gliding. A pair of elytra has 431 durability, resulting in 7 minutes and 11 seconds of gliding time without enchantments. It is possible to apply Unbreaking using an anvil and an enchanted book, which affects the elytra in the same way that enchantment affects tools, increasing flight time to about four seconds of use per point of durability for an Unbreaking III elytra. Firework rockets can be used to propel a gliding player faster than normal. Using a firework rocket while flying will boost the player's speed for the same time as the rocket's flight duration. If the rocket is equipped with a firework star of any kind, the firework explodes at the end of the flight, inflicting 8 ( ) damage. A trident enchanted with Riptide can be used for propulsion as well, but only if the player is in water, rain, or a thunderstorm. When durability reaches 1, the elytra wings will stop working until they are repaired. Since they no longer work, they cannot lose more durability, meaning they can never fully break. The broken elytra has a tattered texture in the inventory. It may be repaired either by enchanting it with Mending, combining two together on a grindstone‌[upcoming: JE 1.14 & BE 1.11.0], or by combining the elytra with phantom membranes in an anvil. Each piece of material will repair the elytra wings by 108 durability points, requiring 4 pieces to fully repair them. Note: Thorns also works as normal on the elytra wings, but can only be put on using commands in Java Edition, or with an anvil on Minecraft Console Edition. Added sounds while gliding with elytra. Issues relating to "Elytra" are maintained on the bug tracker. Report issues there. The first image of elytra, tweeted by Jeb. Click to play. Folded elytra, which resemble the cape the user is wearing. Elytra in an end ship. Elytra with only 1 durability. 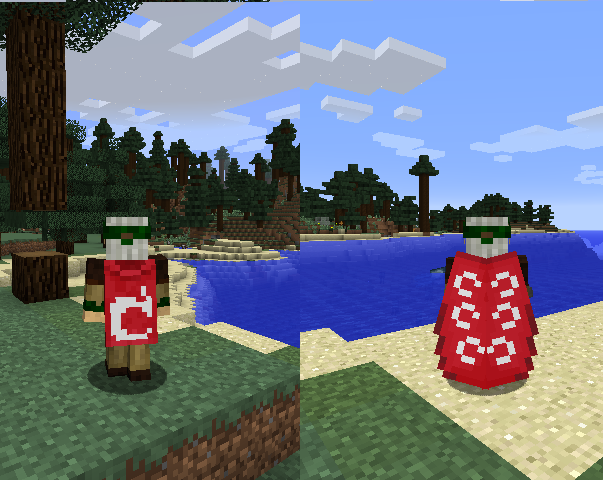 Elytra designs fitting to the official capes, posted by Jeb_ on Reddit. A player gliding while blocking with a shield. Screenshot of Glide mini games. Another screenshot of Glide mini games. Official elytra themed tutorial map. In reality, elytra are the tough forewings of beetles and earwigs that cover the wings they actually use for flight. Elytra are not actually used for flight in real life. It is possible to glide while on a ladder. The player can do this by pressing ⇧ Shift followed by space. This will cause the player to fall, with a speed decided by their vertical rotation. This means that the player can descend very fast on a ladder, but if their speed is too fast when hitting the ground, they can take fatal fall damage. Using a firework rocket can also speed up the player's descent. If the player glides into deep water with elytra equipped, the animation will not stop, making it look as if there's better swimming animations. Once the player touches ground, though, the animation will stop. Additionally, firework rockets can be used underwater but it will give lesser boost duration due to the water's effect, this is useful for underwater swimming. Elytra can be equipped onto mobs using commands, although for some it doesn't work. Most mobs will follow one of three different flight paths (which they cannot control) before landing, at which they will regain their AI. Exceptions to this are squid and chickens, as the squid's AI will cause it to try and "swim" in midair, making it fall straight down because it conflicts with the elytra mechanics. Since chickens fall slowly, they will only move so far. Endermen, tamed wolves and cats which are not sitting will not teleport until they hit the ground. 4J Studios created an elytra-centered tutorial map for console edition when elytra were first introduced to this platform, this map is themed as "ruins of an ancient civilization of Minecraft worshippers" and showcases the new amplified terrain generation. This map can be seen behind the scenes here. On 28 March 2017, 4J Studios added an elytra themed Mini Games for console edition called "Glide"; it consists of Time Attack and Score Attack mode. If you have both the elytra and the slow falling effect and then you press the jump button, you will slightly go upwards, a cheap but time-consuming alternative to fireworks and Riptide tridents. This page was last edited on 13 April 2019, at 13:05.